Remastered from 1980 cassette releases, an earlier project by Nigel Ayers, Caroline K & Daniel Ayers. Sinister beasts, earth mysteries, the occult shenanigans of the royal family, the occult symbolism of British currency, time travelling punk rockers, Nocturnal Emissions merchandising and much, much more. Nigel Ayers, Muslimgauze, John Watermann, Zoviet France, etc. 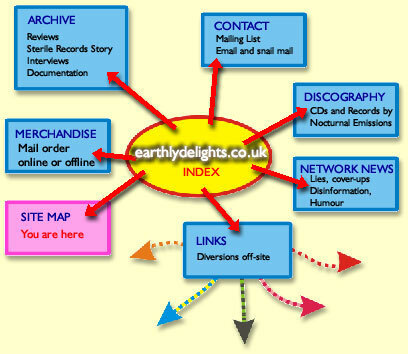 Network News was produced between 1990 and 1999 by various authors associated with the Nocturnal Emissions project and distributed by Earthly Delights.